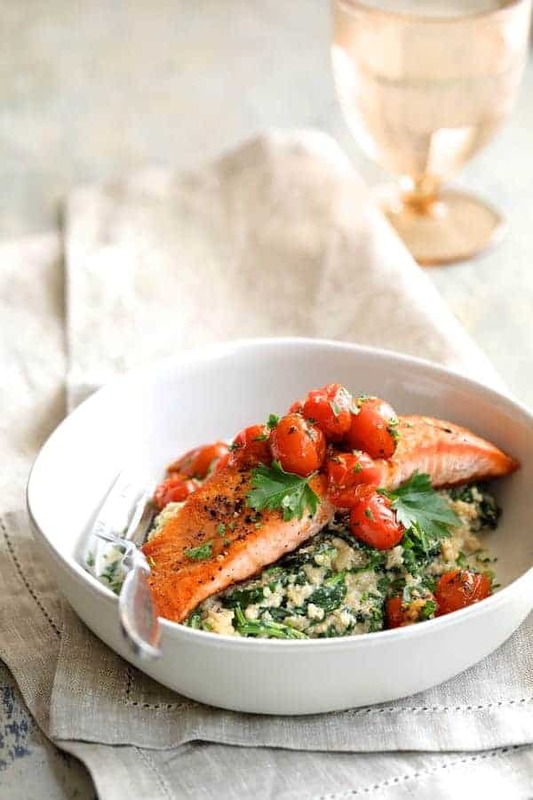 Seared Salmon with Baby Kale Quinotto and Warm Roasted Cherry Tomato Salad is a beautiful restaurant-style dish that’s “better-for-you” all the way around. Perfect for a casual dinner for two, yet elegant enough for guests! Did you know? A recent study has found that adding Mazola® Corn Oil to one’s diet resulted in lower cholesterol levels than Coconut Oil. A previous study found that corn oil can also help lower cholesterol more than extra virgin olive oil. To learn more about the study, see Mazola.com. I grew up on meals my mother cooked with Mazola Corn Oil. Mom trusted it because, living on a farm as we did, it came from something that was familiar–corn. 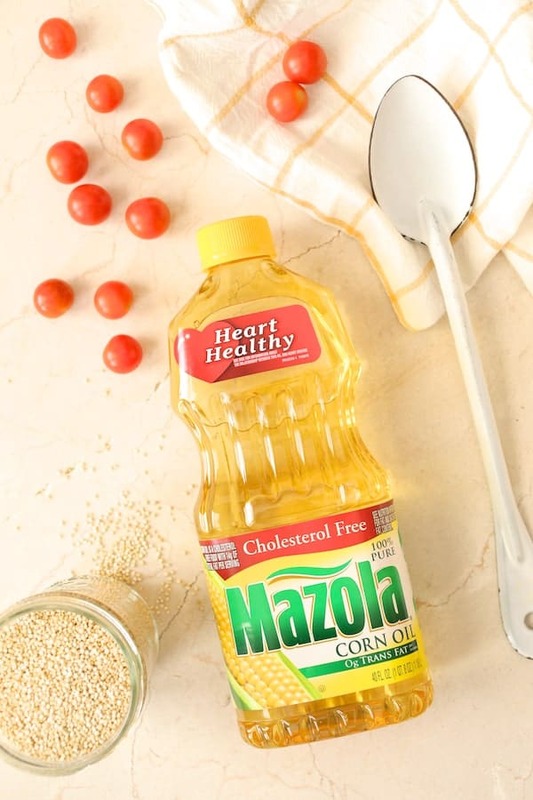 You know if moms used it, Mazola Corn Oil is a part of a healthful tradition in America! Mazola Corn Oil is all-purpose and has a neutral taste that makes the natural flavor of food stand out and doesn’t negatively impact the taste of ingredients. It’s a smart heart-healthy choice for your family. 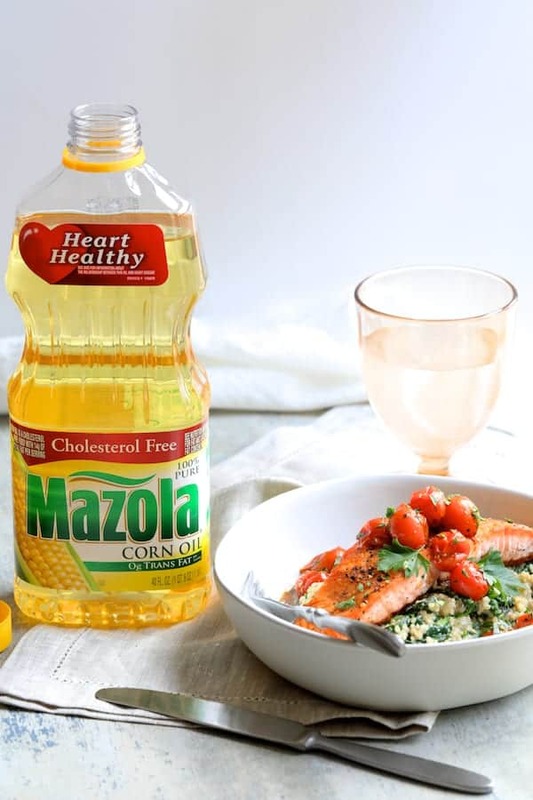 Mazola Corn Oil, along with all of their oils, are cholesterol-free and 100% pure oil with no additives. The flavor of everything you cook will really shine through! Because it’s all-purpose, it’s great for baking, grilling, sautéing, stir-frying or using in a marinade or dressing. Also, Mazola Corn Oil has a smoke point of 450 degrees which is higher than most cooking oils so it’s perfect for all those applications. 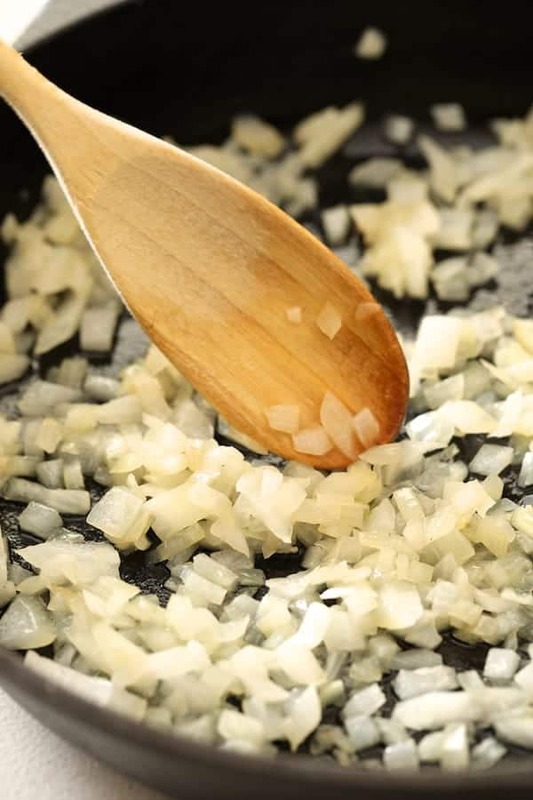 The smoke point of an oil is important to pay attention to as a home cook. Because I cook for clients in private homes, the smoke point of an oil is something I have to be aware of. If the smoke point of an oil is exceeded, the flavor and nutritional value of what I’m preparing is affected. In addition, oil that begins to smoke is also dangerous and can ignite. Mazola Corn Oil is available nationwide and can be purchased at your favorite grocery store so it’s easy to swap out for what you’re currently using. Find out more at Mazola.com. Here’s a delicious recipe that uses Mazola Corn Oil in various ways that I think you’ll love! Seared Salmon with Baby Kale Quinotto and Warm Roasted Cherry Tomato Salad! I used Mazola Corn Oil in every step of the recipe–from roasting to sautéing to searing. In addition, I’ve taken a few other conventional ingredients that would normally be used in an Italian-inspired recipe such as this one and swapped them out for “better-for-you” ingredients. You may have already wondered… What is quinotto? 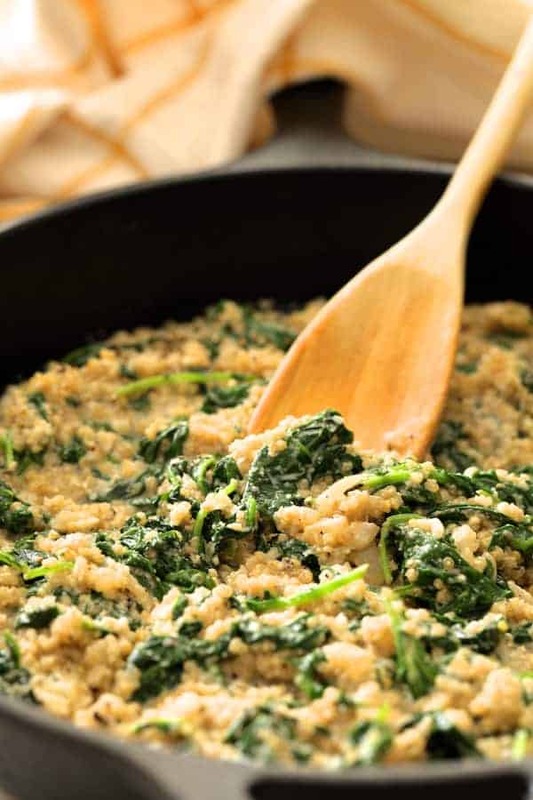 It’s quinoa cooked “risotto-style.” Quinoa is considered an “ancient grain” that sustained many generations in the Southern hemisphere. It’s a plant-based protein that’s also gluten-free. 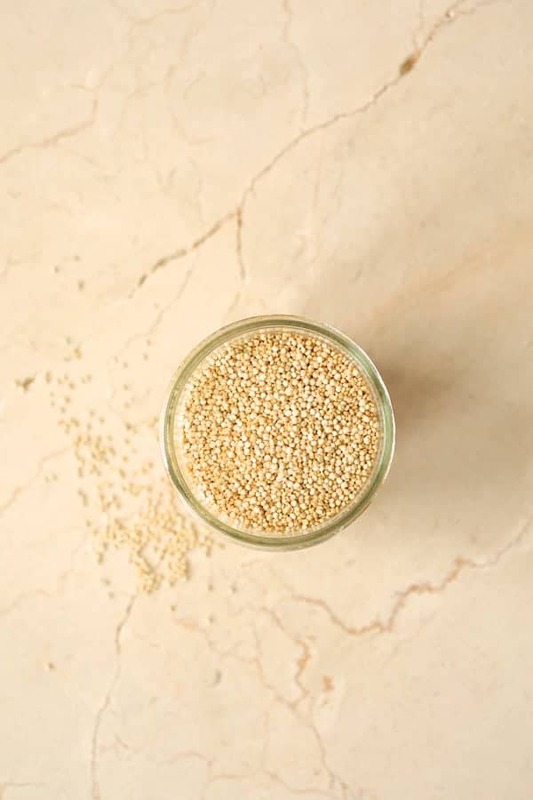 Because it has a bitter coating called saponin, it’s always a good idea to rinse quinoa (if it’s not a pre-rinsed brand) prior to use. You’ll need to make the cashew cream first. It takes a little bit of time, but it’s hands-off time. 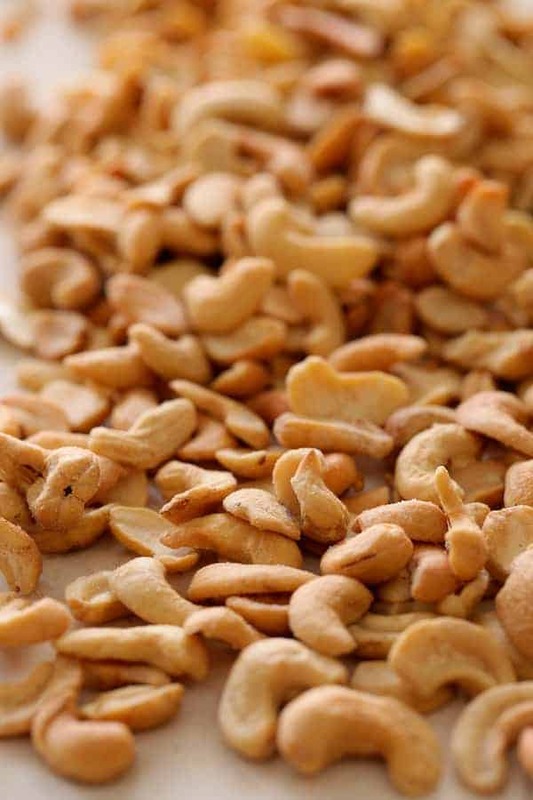 Simply soak roasted or raw cashews in water for at least two hours. Drain off the soaking liquid, then place in a food processor or blender. Add water as needed to achieve a smooth, thick creamy consistency. This recipe makes about two cups which is more than you’ll need for the quinotto, so refrigerate or freeze what you don’t need for future use. Cashew cream is good enough to eat with a spoon! Then, get the quinotto going. 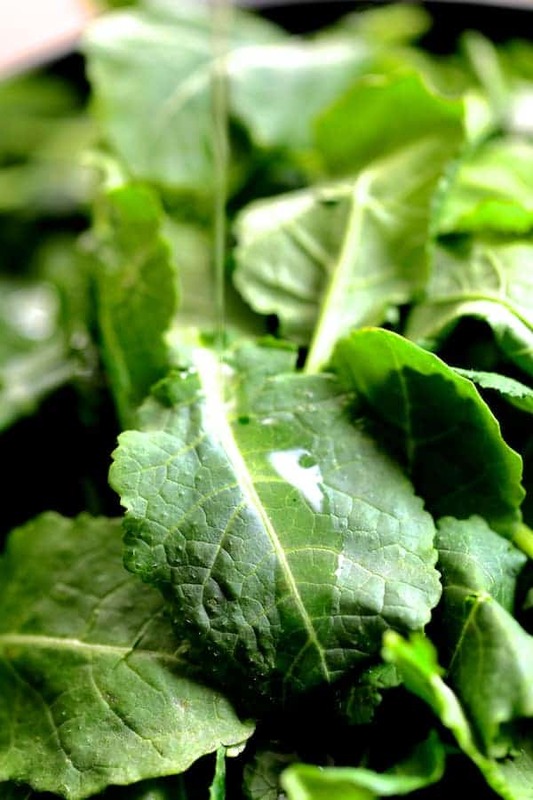 I like to use baby kale in a dish like this rather than regular kale because it’s less work. It can go from the clamshell container right into the pan. 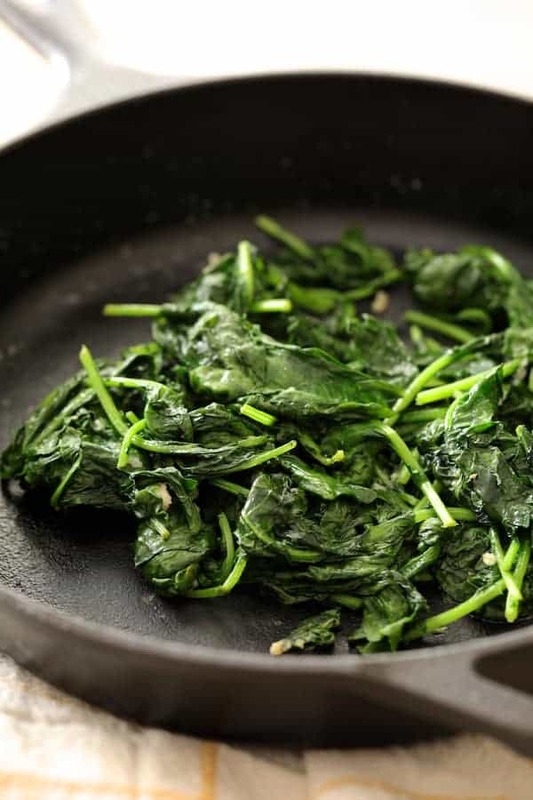 Heat a little Mazola Corn Oil in a skillet or sauté pan and cook the baby kale until it wilts. …Then add chicken or vegetable broth. Simmer, stirring several times until the quinoa is cooked but still has some “bite” left to it. Stir the kale back in and add some of the delicious cashew cream as a cream and cheese substitute. …and roast until blistered and soft. Transfer to a bowl, but be sure to not leave any of the juices behind! 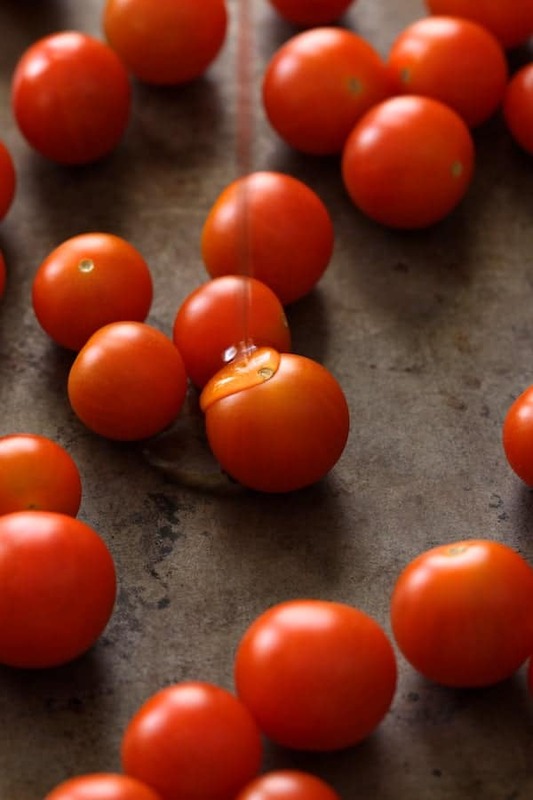 Those juices become part of the salad. Then, cook the salmon. 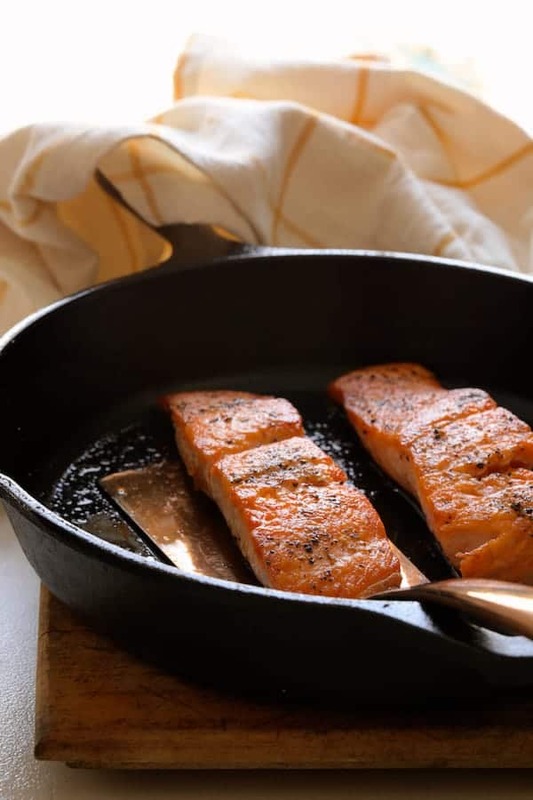 A simple sear in Mazola Corn Oil is all the rich taste of salmon needs to shine through! …And friends! You’ve got a restaurant-style dish that’s wholesome, guilt-free, light and delicious! Seared Salmon with Baby Kale Quinotto and Warm Roasted Cherry Tomato Salad is a meal you can feel good about! 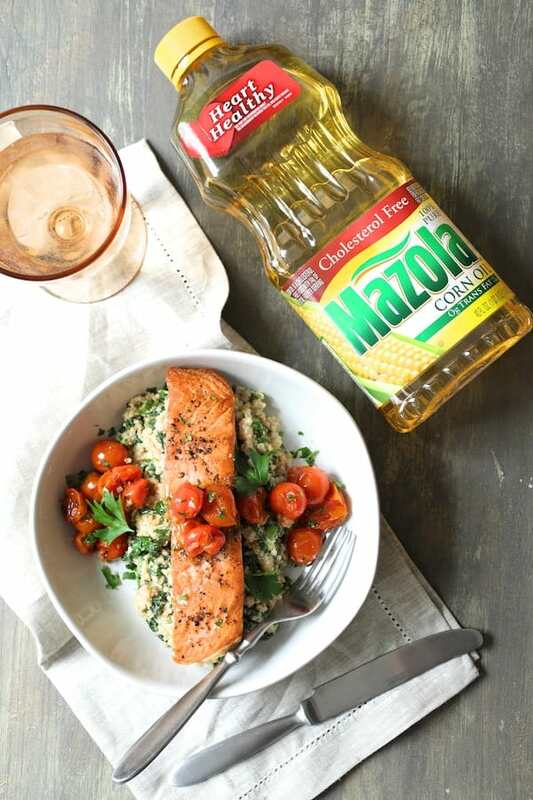 My mom would be proud of me for using Mazola Corn Oil, America’s #1 Selling Heart-Healthy Cooking Oil–the oil she used–to create Seared Salmon with Baby Kale Quinotto and Roasted Cherry Tomato Salad. It’s a dish that’s all about cooking for today! Remember to visit Mazola.com for more information and other great recipes! Check them out on Facebook @MazolaBrand. 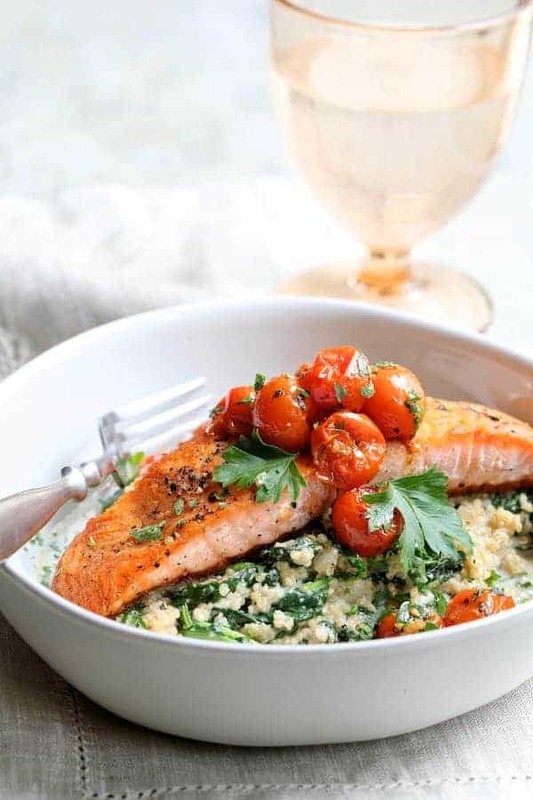 Seared Salmon with Baby Kale Quinotto and Warm Roasted Cherry Tomato Salad is a beautiful restaurant-style dish that's "better-for-you" all the way around. Perfect for a casual dinner for two yet elegant enough for guests! QUINOTTO: Place cashews in a bowl. Cover with hot tap water and soak at least 2 hours. Drain. 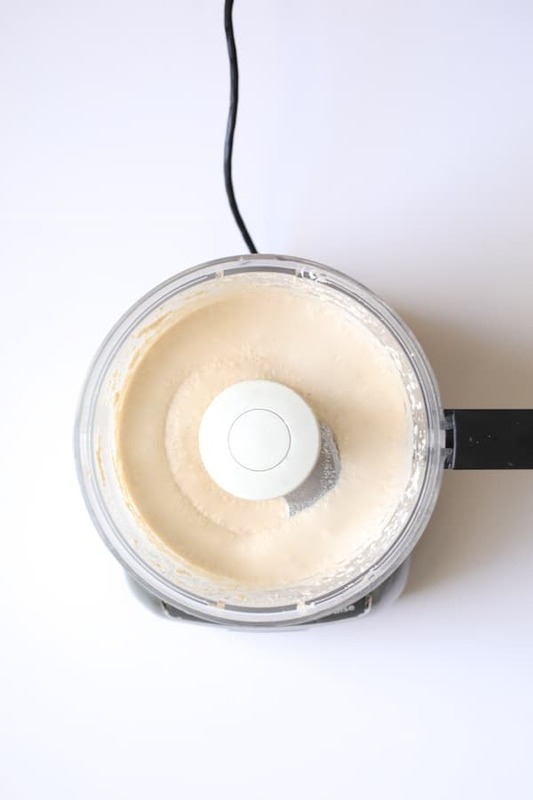 Place cashews in a food processor or blender with 1 cup water. Puree until smooth, adding additional water as necessary. Thin with more water to desired consistency. Set aside 1/2 cup cashew cream and refrigerator or freeze the remainder for another use. 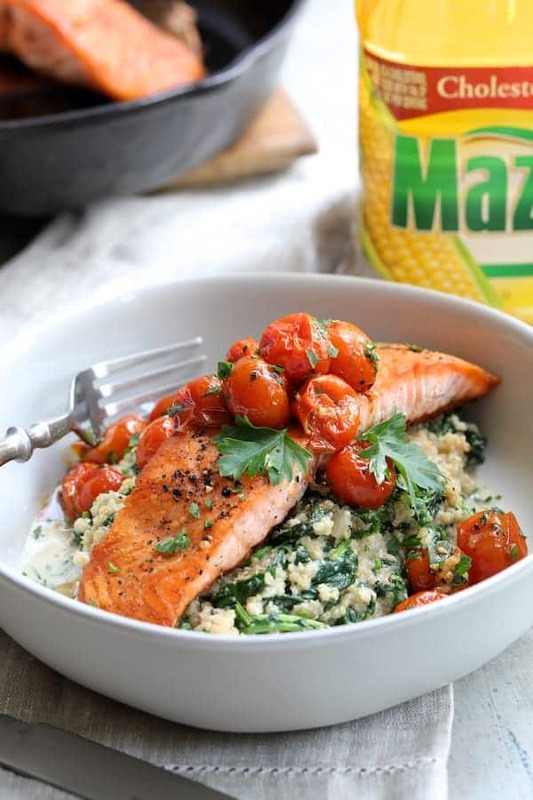 Heat 1 tablespoon Mazola® Corn Oil in a skillet or saute' pan over medium-high heat. Add the baby kale and cook 3 to 4 minutes, moving it around with tongs until wilted. Season with salt and black pepper to taste. Transfer to a plate or bowl. Heat remaining Mazola® Corn Oil in the same skillet or saute' pan over medium-high heat. Add the onion, reduce heat to medium and cook 4 to 5 minutes or until beginning to soften. Add the garlic and cook 15 seconds or until fragrant. Add the quinoa and stir briefly. Add 1 cup chicken or vegetable broth. Bring to a boil, reduce heat to medium-low and simmer uncovered 12 to 15 minutes, adding additional chicken broth as necessary until quinoa is cooked through. Stir in baby kale and 1/2 cup reserved cashew cream. Season to taste with salt and black pepper. Keep warm. CHERRY TOMATO SALAD: Preheat oven to 375 degrees. 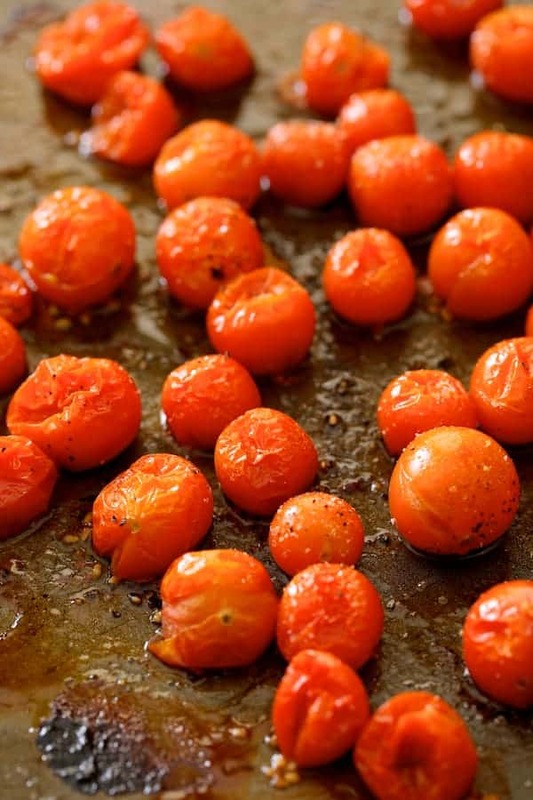 Place cherry tomatoes on a baking sheet. Drizzle with Mazola® Corn Oil and season with salt and black pepper. Roast for 20 minutes or until blistered. Transfer to a bowl along with all the accumulated juices. Add the garlic, balsamic vinegar and parsley. Cover to keep warm. This looks so incredible. 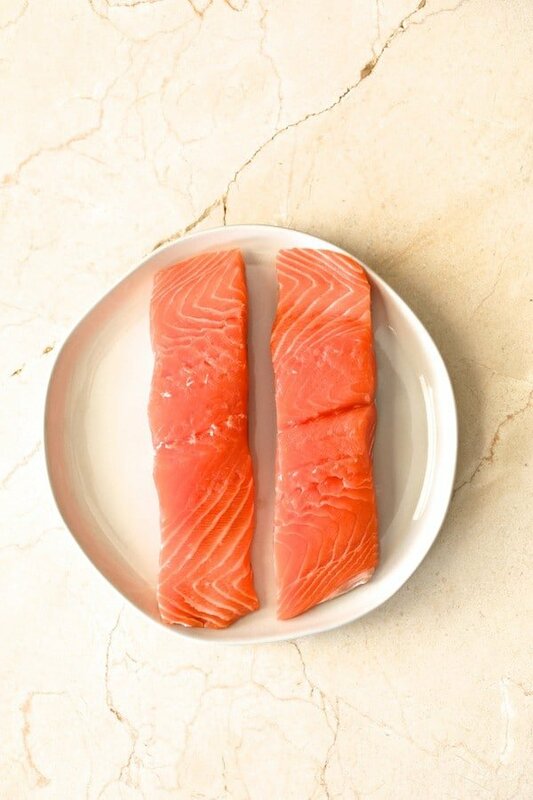 I love salmon and your presentation is so beautiful; a perfect melange of textures and flavors. Hey, Cakespy! Thanks so much! It’s really a great dish! I cannot rave enough about this meal! First of all, due to health reasons a few years ago, I really changed a lot of what I eat. Mazola is one of the few oils I will use. It is fabulous and much healthier than many. I have stayed away from risotto because I limit carbs. You have introduced me to quinotto. I love the blistered tomatoes and salmon. My family is going to love this one. Going to be added into the rotation this week! Thanks so much, Eileen! I hear ya on the oils! Hope you enjoy! Beautiful dish and fairly easy to make. I need to prepare this today for Lent! Thanks for your participation on this shop. Thanks so much, Adriana! Hope you enjoy and was honored to do it!